This stereo scene from the Mast Camera (Mastcam) on NASA's Curiosity Mars Rover shows boulders composed, in part, of pebble-size (0.2 to 2.6 inches, or 0.5 to 6.5 centimeters across) and larger rock fragments. The size and shape of the fragments provide clues to the origins of these boulders. This image is an anaglyph that appears three dimensional when viewed through red-blue glasses with the red lens on the left. The separate right-eye and left-eye views combined into the stereo version are Figure 1 and Figure 2. Mastcam's right-eye camera has a telephoto lens, with focal length of 100 millimeters. The left-eye camera provides a wider view, with a 34-millimeter lens. These images were taken on July 22, 2016, during the 1,408th Martian day, or sol, of Curiosity's work on Mars. For scale, the relatively flat rock at left is about 5 feet (1.5 meters) across. The rock in the foreground at right is informally named "Balombo." The group of boulders is at a site called "Bimbe." 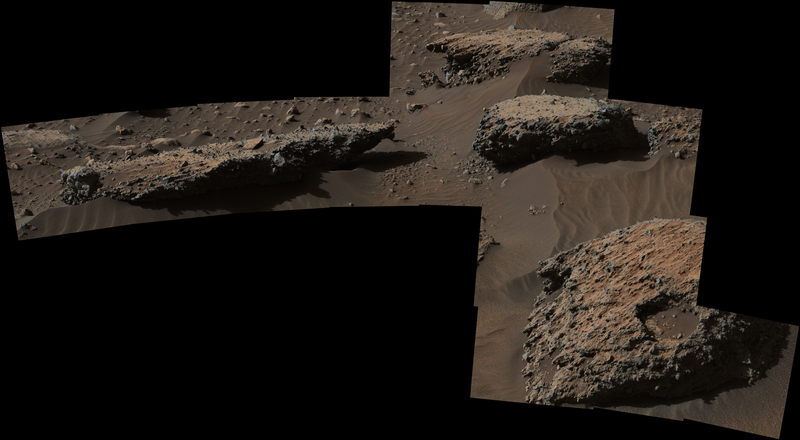 The Curiosity team chose to drive the rover to Bimbe to further understand patches of boulders first identified from orbit and seen occasionally on the rover's traverse. The boulders at Bimbe consist of multiple rock types. Some include pieces, or "clasts," of smaller, older rock cemented together, called breccias or conglomerates. The shapes of the inclusion clasts -- whether they are rounded or sharp-edged -- may indicate how far the clasts were transported, and by what processes. Breccias have more angular clasts, while conglomerates have more rounded clasts. As is clear by looking at these boulders, they contain both angular and rounded clasts, leading to some uncertainty about how they formed. Conglomerate rocks such as "Hottah" [PIA17062] were inspected near Curiosity's landing site and interpreted as part of an ancient streambed. Breccias are generally formed by consolidation of fragments under pressure. On Mars such pressure might come from crater-forming impact, or by deep burial and exhumation. Malin Space Science Systems, San Diego, built and operates Mastcam. JPL, a division of Caltech, manages the Mars Science Laboratory Project for NASA's Science Mission Directorate, Washington, and built the project's Curiosity rover. For more information about Curiosity, visit http://www.nasa.gov/msl and http://mars.jpl.nasa.gov/msl.